We can’t say for certain how long this deal will be available on Amazon, but we can say with absolute certainty that it’s the best bargain you’ll find right now when it comes to cooking gear. 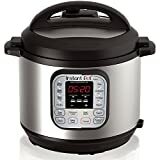 The Instant Pot DUO60 6 Qt 7-in-1 Multi-Use Programmable Pressure Cooker needs no introduction. It’s the most popular multi-use slow cooker on the planet right now and it has amassed more than 23,000 5-star reviews on Amazon. It normally sells for $100, which is more than fair considering how great it is and how much use you’ll get out of it. If you snag one right now on Amazon, however, you’ll only pay $79.96. That’s right… this nice big 6-quart version is currently on sale for 3¢ less than the 3-quart model!